Brent oil prices decreased by 4.22% or US$3.59, as prices rose this week. Oil traded on October 11, 2018 at a price of US$81.44 per barrel relative to US$85.03 last week. Brent oil began the year at US$68.07 per barrel. 87 Octane prices decreased week over week, by 0.09% (JMD$0.13). 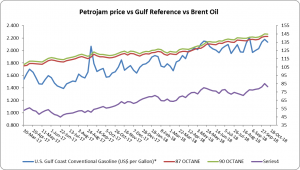 Additionally, 90 Octane decreased by 0.09% or (JMD$0.13) week over week. 87 Octane and 90 Octane opened the year at J$121.04 and J$123.88 respectively and now trades at J$141.89 and J$144.73 per litre respectively. There was an increase in U.S. propane/propylene stocks last week by 1.5 million barrels to 80.3 million barrels as of October 05, 2018. This was 5.8 million barrels (6.8%) lower than the five-year average inventory level year over year. Gulf Coast and East Coast inventories increased by 0.8 million barrels and 0.5 million barrels, respectively. Rocky Mountain/West Coast and Midwest inventories each rose by 0.2 million barrels. Propylene non-fuel-use inventories reflected a 2.5% of total propane/propylene inventories. Disclaimer: Analyst Certification -The views expressed in this research report accurately reflect the personal views of Mayberry Investments Limited Research Department about those issuer (s) or securities as at the date of this report. Each research analyst (s) also certify that no part of their compensation was, is, or will be, directly or indirectly, related to the specific recommendation (s) or view (s) expressed by that research analyst in this research report.